Ancient yogic teachings say that impurities in our internal body adversely affect our state of mind and prevent the attainment of true contentment. 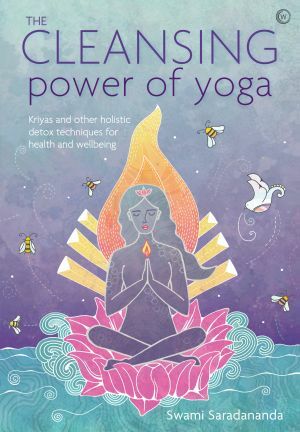 As such, a range of ancient yoga techniques called kriyas, which were designed to cleanse the body, mind and emotions, can have far-reaching relevance in today’s society of frequent over-consumption and overwhelm. After an introduction to the detoxifying power of yoga in all its forms (both on and off the mat), Swami Saradananda presents six main chapters of kriyas and other cleansing techniques relating to our five senses and the mind (which controls our senses), each with a specific aim: clarifying our vision in life (sight), enhancing our communication skills (sound), optimizing our energy and allowing us to breathe more deeply (smell), nourishing us and enhancing our capacity to ‘digest’ life (taste), enhancing our connection with others (touch), and simplifying our life and filling it with sublime thoughts (mind). Each chapter includes at least one yoga pose as well as a breathing exercise, mudra, mantra, cleansing visualization and any more specific techniques relevant to optimal wellbeing in that area. The book then ends with a chapter of routines for a wide range of conditions, from physical complaints such as headaches and arthritis, to emotional ones such as depleted energy and stress. The end result? Readers will end up with all the holistic detox tools they need to feel overall lighter, happier and healthier in their own skin.